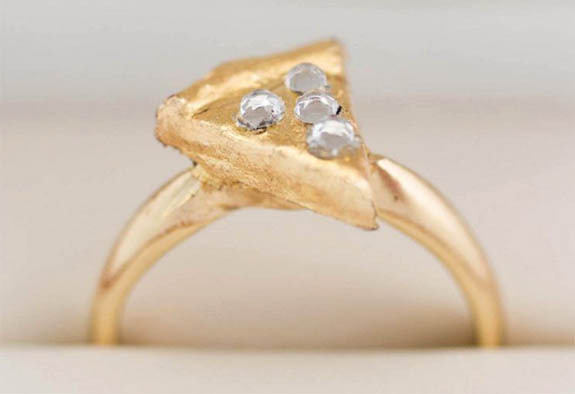 Domino's in the UK just celebrated Valentine's Day by giving away a one-of-kind, 22-karat pizza-slice engagement ring topped with diamond pepperoni. The fast-food chain delivered nearly a half-million pizzas throughout the UK yesterday, and the company was certain that a significant portion of those dining in would be proposing to their significant others on the most romantic day of the year. Domino's own study revealed that 72% of Brits were planning to eat in on Valentine's Day, with 6% of men planning to pop the question during the meal. The unusual ring was introduced on Domino's Facebook page under the title "DOUGH-MANTIC ANNOUNCEMENT." The company posted a series of pizza-ring photos along with this teaser: "Fancy popping the BIG question to your pizza lover while you #ValenDineIn this year? Comment below for your chance to win our one-off, unique pizza engagement ring. Probably the most taste-ful way to seal the deal, ever!" Contestants were required to comment on the post between noon and 10 p.m. on February 13. 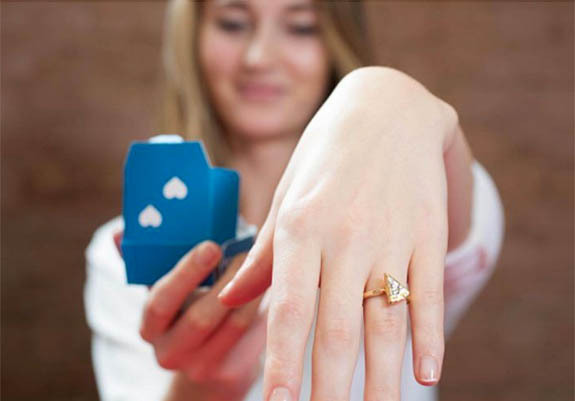 The company promised to pick a winner and deliver the engagement ring on Valentine's Day. 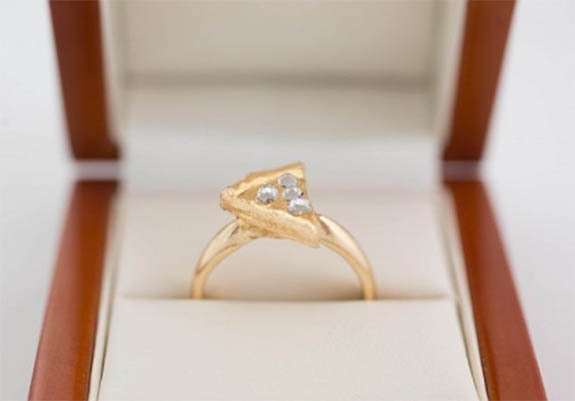 The yellow gold ring is designed to look like a lifelike slice of pizza topped with four round diamonds that are made to appear as if they are pepperoni slices. Penned Kate Smith, "My fella has just proposed to me, but this would be a true symbol of our love. Our first Valentine's Day was actually spent with a Domino's pizza and watching football on TV nearly five years ago now. This would be the topping on the pizza if I had this ring." Added Shannon Wilmot, "I just showed my husband this ring and his response was "WHY ARE WE MARRIED ALREADY!?" When I then explained [the contest is] open to everyone, he told me I had to enter. I think he'd probably end up wearing it more than me or we could share if it fit both of us." Founded in 1960, Domino's Pizza has 11,000 stores in 75 countries. The company employs 260,000 and generates annual sales of $2.2 billion. That's a lot of pizza. Credits: Photos courtesy of Domino's.